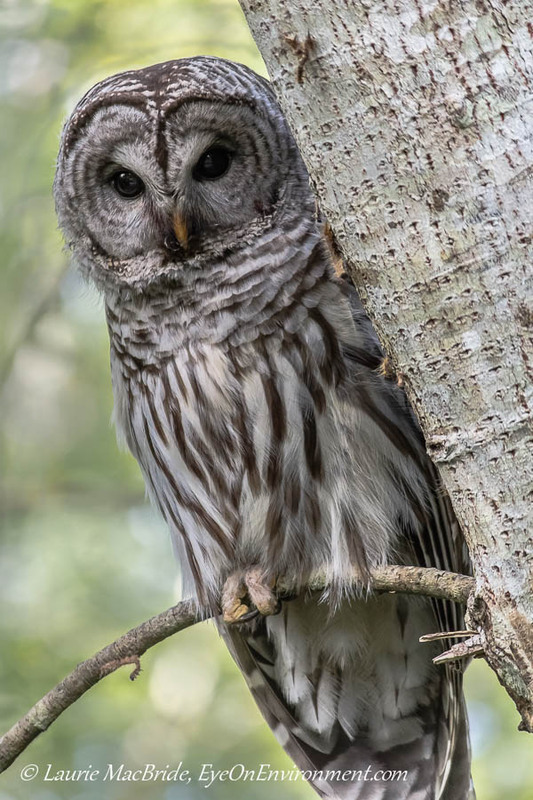 Less frequently, we catch a dialogue between two Barred owls, sounding more like a loud gang of crazed chimpanzees than a couple of birds. The strange, hilarious caterwauling lasts for a quarter hour or more, rising and falling in pitch, speed and volume. At those times, it’s best to give up any hope of sleep and just enjoy the broadcast. But we don’t see these large birds very often, and when we do, it’s usually at a distance. During one week this past summer, though, we had some very close views when one visited our place, drawn by the prospect of tasty songbird nestlings. We might have missed seeing the owl, but the prolonged robin ruckus gave it away. Their loud alarm calls indicated a predator was about, but what, and where? I went to investigate, expecting to shoo away a neighbour’s cat, but half way across the little bridge over our pond I came to a sudden stop. Almost within arm’s reach, on the lowest limb of the willow, sat the source of robin angst: about two feet (60 cm) in height, silent, still, and eyeing me with no apparent concern. I’m not sure how the battle ended that day, as eventually I had to get on with my to-do list. But three more times that week, a similar robin ruckus led me to the owl: in the willow again, then in a nearby Douglas fir, and finally on a branch of the Bigleaf maple that overhangs our patio. We were glad when the big bird finally moved on. Peace reigned again in our little robin kingdom, and those gawky fledglings could get on with the vital business of learning to fly. Here’s a link to the amazing caterwauling and other sounds that Barred owls make (from Cornell Lab of Ornithology). Enjoy! Posted by Laurie MacBride, Eye on Environment on December 15, 2013 in Animals & Wildlife, Birds and tagged animal behavior, baby birds, feathers, nature, owls, photos, predators, summer. Oh Laurie, what a great photograph! I just LOVE owls, even though they do have a bit of a darker side due to the role they play in nature. This is such a terrific shot, great details here my friend! Thanks, Toad! The owl was a good portrait subject for sure – no fear of me and not in any hurry to leave. Best of the season and a happy new year to you and Mrs. Toad! Amazing capture of that beautiful (but deadly) owl. Had to laugh at that brave robin and the image of him kicking the owl in the head. Great story, Laurie. Glad you saw the owl but that he has moved on and peace reigns again! Thanks Sherry. I only wish I could have managed to get some photos of the robins in action, especially that kick! Alas, I was hand holding my camera, and my lens is a slow one. The owl, by contrast, was easy to photograph, since it remained so still! I wish I had taken that photo! Well captured as always Laurie! Thanks Susan! The owl was indeed very beautiful, despite its deadliness.